Two events have rocked the nation’s Capital in less than a week. First was the demolition drive carried out by the railways in Shakur Basti area on 12 December and the second was the raid carried out by CBI on the office of the Principal Secretary to the Chief Minister of Delhi on 15 December. While both events were necessary, one could argue that possibly both could have been handled in a more mature manner. The political drama that has unfolded in the aftermath and verbal slander unleashed, particularly by Mr Kejriwal, has recorded a new low in Indian politics. But then politics and politicians in India do not follow any norms of decency or good public conduct. There is no doubt that prior to the advent of Mr Narendra Modi and Mr Kejriwal on national political scene, a social bonhomie, primarily for mutual benefit and convenience, existed between different political parties and their leaders for decades. That bonhomie has been blown apart and many politicians have been sidelined and many others are scared of suffering the same fate. Therefore it is no secret that most political leaders who are out of favour today blame their current status entirely to rise of Mr Modi and gang up at the drop of hat to close ranks against him, all past differences forgotten. On the other hand Mr Kejriwal is the eternal confrontational child of Indian politics who is ever ready to take Congress and BJP head on irrespective of the nature or gravity of the issue. Unfortunately he also seems to be fighting some personal battles against a few political leaders, Mr Modi being the most prominent among them. The later is what is totally undesirable since Mr Kejriwal has not been given an unprecedented mandate to fight personal battles or to seek retribution for personal grievances. His mandate is to govern Delhi and represent people of Delhi. As on date it does appear as if he is fighting more personal battles at the cost of Delhi and its people. Mr Rajendra Kumar was an officer close to Mr Kejriwal and enjoyed his confidence; this is true because Mr Kejriwal himself chose him as his principal secretary over many others. He had also worked for Mr Kejriwal in his first short stint as Chief Minister of Delhi. The recent investigation against Mr Rajendra Kumar started about six months ago and therefore the raid was not any hasty action carried out with view to embarrass the AAP government or it’s Chief Minister. It is also pertinent to put on record that Mr Rajendra Kumar had been under investigation since 2007 for various reasons. Transparency International, an international body that fights against corruption, had also warned Mr Kejriwal in writing in May this year regarding the doubts on the integrity of Mr Rajendra Kumar but Mr Kejriwal and his party are silent on this issue. It is part of a normal procedure for Chief Ministers to carry out a background check before appointing any officer in their office in an important position and it will be fair to assume that it was done in this case too. When CBI carries out any raid, it is invariably as a result of an investigation that brings to light some credible evidence of wrong doing on part of any individual. Such raids are always carried out after obtaining search warrants from the court based on evidence collected. Another aspect that is connected with the raid is the element of surprise since any prior intimation to concerned department or office may result in compromising the whole issue, sometime by vested interests and at times inadvertently. It is also part of the procedure that the CBI not only raids the office of the concerned individual, but also the offices of his associates, the beneficiaries apart from residences of those likely to be involved. Any raid in an office will invariably lead to inconvenience for others working in those premises for the duration of the raid. It also cannot be ruled out that some other offices connected with the officer under investigation may also be searched for evidence. Last but not the least AAP has always advocated that CBI should be an independent body allowed to raid offices and premises of those under investigation for corruption without any reference to other authorities. The facts of the case throw some interesting questions that need answers- mainly from the Chief Minister himself. Was a due diligence carried out before appointing Mr Rajendra Kumar as the Principal Secretary? Did the due diligence bring out the fact that the officer was under investigation for corruption and misuse of his position? Did Mr Kejriwal overlook the officer’s past record while appointing him or is it that no diligence was carried out since the officer in question was already close to the CM? Is the CM trying to save his officer or deflect the issue by terming it as a raid on the CM’s office? If AAP believes that CBI must be empowered to carry out raids and searches without any special permission from other authorities, then why is Mr Kejriwal and his party making so much noise on this raid? Instead of addressing these questions and coming clean on them, it does appear that Mr Kejriwal is trying to either complicate or deflect the matter by raising the boggy of a raid on the Chief Minister’s office. Mr Kejriwal and his party should actually welcome the raid since it is in line with their own propagated philosophy. Their grouse that they should have been informed beforehand of the impending raid does not hold much water. Unfortunately the Principal Secretary’s office has to be in close proximity of his immediate superior, in this case the Chief Minister. Therefore any such raid will not only inconvenience the CM but may also overflow to adjoining offices. It does appear as if the CM is feeling embarrassed at having appointed such an officer to an important post and now he wants to cover up his mistake by saying that the raid was on the CM’s office. Mr Kejriwal has reportedly stated that “Rajendra Kumar is one of our most trusted officers. To raid him is to raid the CM”. Such bizarre defence in light of mounting evidence against the officer only shows AAP’s double faced approach to their fight against corruption. The ploy of raising the Delhi & District Cricket Association (DDCA) investigation boggy and pointing fingers at Mr Arun Jaitley too is targeted towards diverting the attention from Mr Rajendra Kumar’s case since that points fingers at AAP and Mr Kejriwal. The timing of bringing the DDCA case in open leaves no doubt in this regard, otherwise why was Mr Kejriwal sitting silent on the findings of the three member committee which submitted its report to Delhi government in mid November itself. In their press conference on 17 December the representatives of AAP hardly brought out any substantial charges. Notwithstanding that, the DDCA case is an altogether different matter and if based on an investigation some irregularities are substantiated, then concerned office bearers including Mr Jaitley will certainly be answerable. For the present it is Mr Kejriwal and his team who have to do some answering in the case involving their Principal Secretary. It may do Mr Kejriwal some good to stand up like a man and come clean instead of trying to pull wool over the eyes of everyone. The proverbial cries of ‘wolf wolf’ by Mr Kejriwal and his team to divert attention whenever they are in trouble do not cut much ice with informed citizens. Mr Kejriwal has received huge mandate from citizens of Delhi to represent them and to look after the interests of the state of Delhi. In doing so he has to ensure an exemplary conduct and a mature approach since he represents the people of Delhi. It is not his individual battle or a mandate that gives him freedom to do as he pleases. Surely no citizen of Delhi will like that his nation’s Prime Minister is ridiculed or showered with choicest abuses as Mr Kejriwal has done. While in a run up to any elections, some excesses may be condoned, the same cannot be allowed when, duly elected, one holds the office of the Chief Minister. His utterances show an utter disregard to propriety, disrespect for the high office of the Prime Minister and a lack of civility in dealing with higher echelons of the government. What is even more disturbing is the fact that other party functionaries in AAP are also following in his footsteps and showing scant respect for the Prime Minister or his office. If you feel aggrieved, fight by all means but there has to be a method to that fight which keeps it within the realms of decency and decorum expected from a CM. The reaction from Mr Kejriwal on the whole issue has been rather unbecoming of a Chief Minister and someone who enjoys such a huge mandate from the public in Delhi. There will be few, if any, Delhi citizens who do not feel that they have been let down by the conduct of their maverick CM. 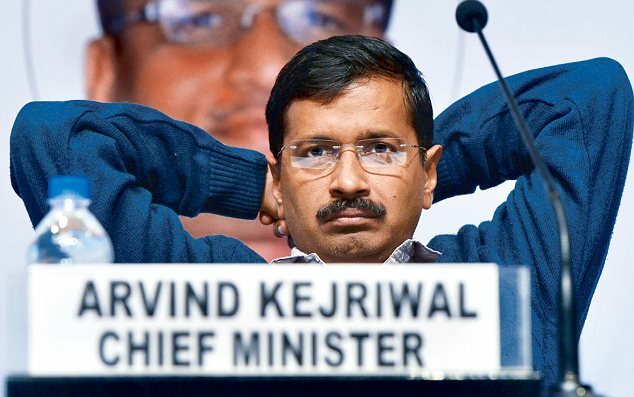 It is an open secret that Mr Kejriwal has been perpetually at loggerheads with the centre, at times for valid reasons but mostly on frivolous matters since his whole approach, from the day he assumed office, has been based on confrontation with the central government and personal attacks on Mr Narendra Modi, the Prime Minister of the country. Without a doubt it is his way of ensuring personal publicity with a view to develop an image of being a crusader. Personal ambitions and false pride seem to be overtaking his obligations towards the state of Delhi and its people. It may be a good idea for Mr Kejriwal to understand that selfishness is one of the more common faces of pride. This results in one seeing how anything and everything happening around him affects him personally that invariably leads to self-conceit, self-pity, worldly self-fulfilment, self-gratification and self-seeking. That I am afraid is not what Delhi bargained for when it voted you to power. In this context it may be good to recall the words of wisdom spoken by Martin Luther King wherein he said “Every man must decide whether he will walk in the light of creative altruism or in the darkness of destructive selfishness”. The choice for you, Mr Kejriwal, is very clear, the point is do you have the courage to make the right choice? the author should understand that AAP OR BJP OR CONGRESS…all r one and the same…the author should not distinguish between different parties…all parties are totally corrupt…the author is questioning kejriwal…why the author is not questioning modi?…..did the author forgot “15 lakhs ” promise by modi?…amit shah has said it as election jhumla…the author is BJP appeaser…..the author 1st should say that…..modi ,amit shah and arun jaitley are totally corrupt …modi is same like any other politician….he is cut from the same cloth…the author should stand on the side of justice not on the side of bjp and modi….